I was out for my usual Sunday bike ride when I ran into problems. My rear tire started feeling “squirley”. However, I ignored the warning signs and truged on. And then I started to feel the bumps from the road and I knew it was loosing air pressure. Since I was at the halfway point, I had no choice now but to try and make it home. Unfortuantely, it went flat soon after that. And I started walking home. I made it to 1460 and Westinghouse and headed South. Thankfully, someone stopped and offered me a ride! It was a couple who saw me while driving north and turned around to stop. And they could not be more inconvenienced. They were on their way to Church, they had groceries in the back of the Surburban, and they had a sleeping child in the car. But they stopped to help me. And I really appreciated it. We had to struggle to fit the bike in the back but we finally made it. While we drove to my home, we talked. And I learned that the husband was a biker and had an experience where there was a crash of many bikers (one with a broken jaw) and noone stopped to help. I also learned that they lived south-east of Hutto but went to church in Georgetown (quite the commute). 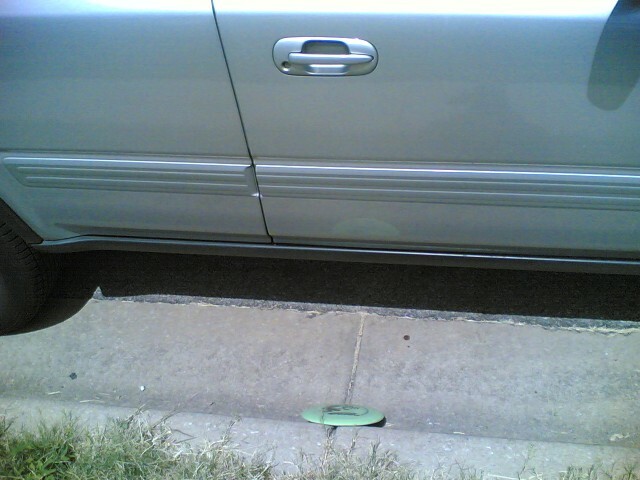 It was a little depressing when I was walking down the road and a pickup truck beeped at me as it passed. I was as far as possible against the edge of the road (when I would be a little further out when biking). So I didn’t think that was the problem. I wonder why they did it… My guess is that its that car equivalent of the Simpson’s bully “ha ha” laugh. This entry was posted in Biking on July 30, 2006 by Mark. 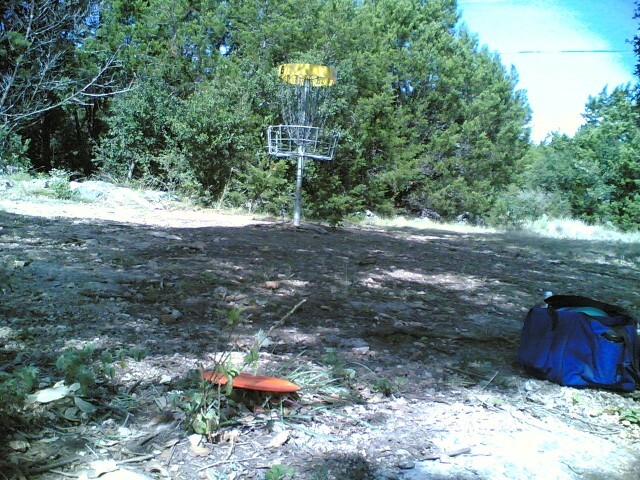 On hole 6, I had my best approach shot so far. Close enough to putt… When you drive from the tree you have a small area with trees on either side of the tee box. 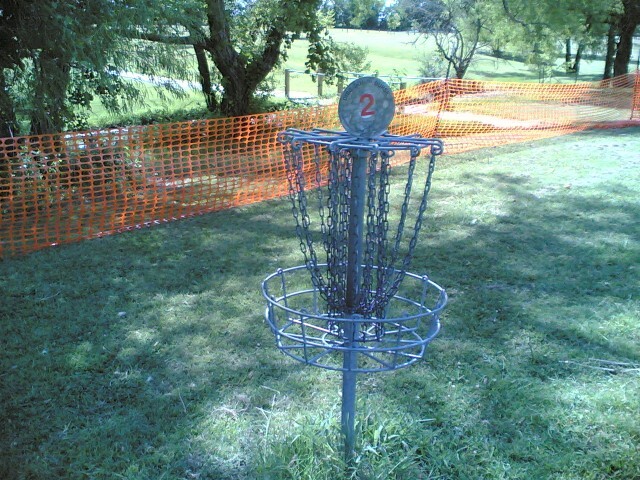 You have to then angle the disc high over a clump of trees to the right. The disc should then fall back to the course (in front of a very large oak — you guessed it — tree). Jon had a pretty far drive on hole 18. The goal is located next to the road and is protected by two lines of trees. There is a small hole for a path, but not much else. When Jon threw it, he knew it was going far. We didn’t believe how far it went until we found it on the street! Wow! For lunch we went to Extreme Pizza. John and Adam were going to Tim’s to play games. Jon and I were going home. But then John suggested we play Tichu over at Tim’s. And that was enough to convice both Jon and myself to play! 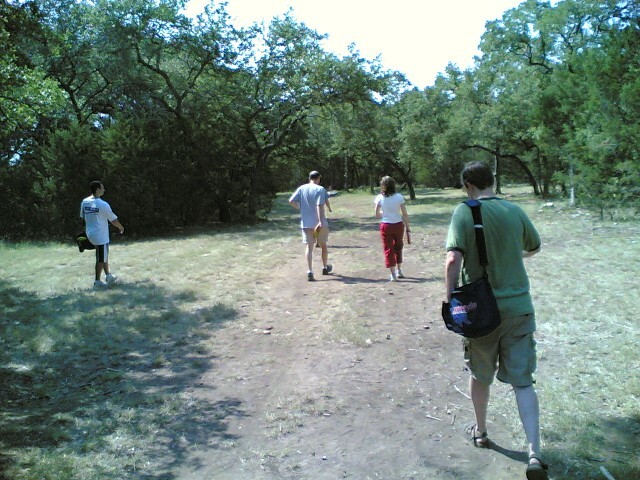 This entry was posted in Disc Golf on July 29, 2006 by Mark. 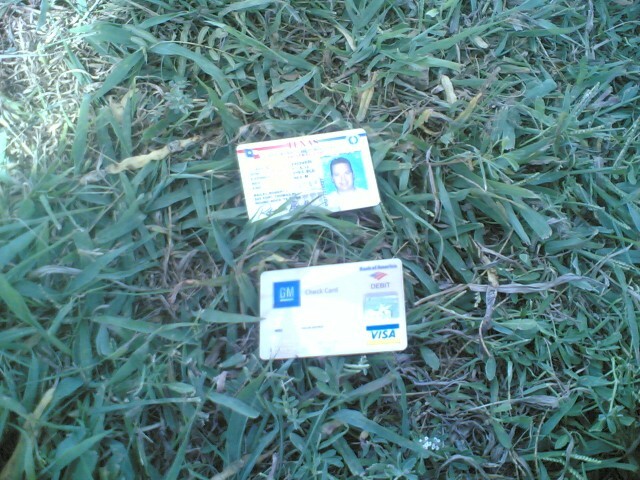 During our game of disc golf at Old Settler’s Park, we came across a license and bank card sitting right next to the tee for hole 8. It must have dropped out of someone’s bag earlier. I picked them up and took them home. I tried looking up the address online, but was unsuccessful with Google’s maps and Mapquest. So, I tried calling, but no one was home. I ended up putting them in an envelope and mailing them. Hopefully, the post office knows where that address and they will arrive. 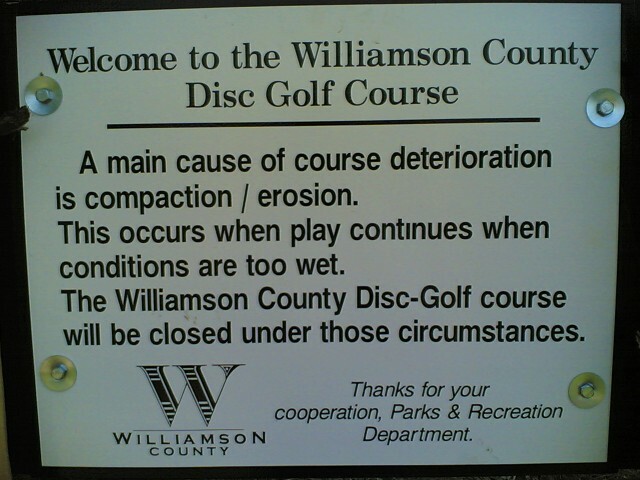 This entry was posted in Disc Golf on July 28, 2006 by Mark. I was pretty much left alone during the game. At one point, John decided to attack one of my cities. He was getting squeezed by Mike, Adam, and Marty. So he decided to venture into my territory. Unfortunately, he did not have quite enough to take over the city he wanted. I spent a while kicking him back out. 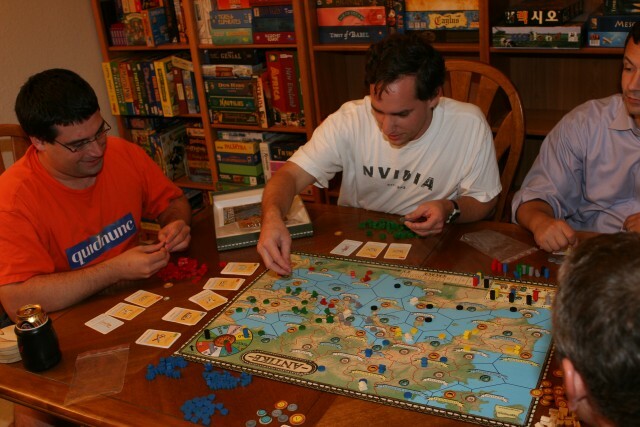 Mike was agressive and took a risky expansion strategy which paid off for him at the end. 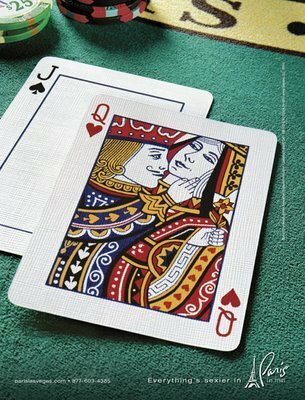 He was able to win the game. We did a new rules variation where if you have researched all of the technology, you can get a victory point (choose from any card). Chapel was mean and took the card I was going after… hehe… oh well. Mike Chapel brought a new game for us to try out called Credit Mobilier. The production values are pretty low and look like pre-schoolers designed and built it. 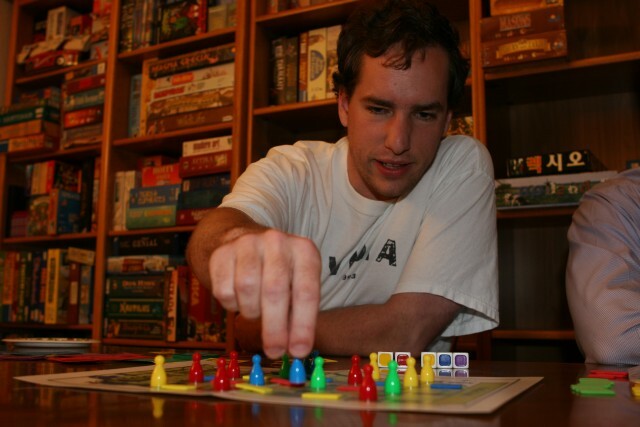 It is a somewhat quick dice game about trying to make money by moving goods from one side of the board to the other. The fatal flaw in this game is the five dice. These dice determine what actions you are allowed. If you roll horribly, you are hosed. 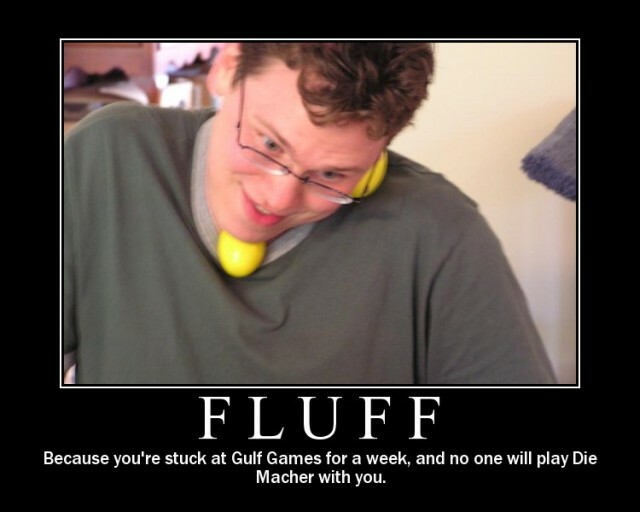 And if you continue to roll badly, you really hate playing this game. There is a general fund (colored purple) and 4 company funds (colored red, blue, green, and yellow). For each share that you purchase, you get payed off a dollar from the company coffers. Due to the setup of the board, some shares look more promising than others, so you try and purchase their shares. But you must roll the color of the company on one of the five dice. Are you starting to see the dice problem? When you build track (again having rolled the color) or move goods along a track (rolled of course), money is deposited into the different company coffers. If you are lucky enough to own shares in a company, you will want to initiate a payout. But you have to roll the color of the company AND an orange color (adding to the general rolling problems). 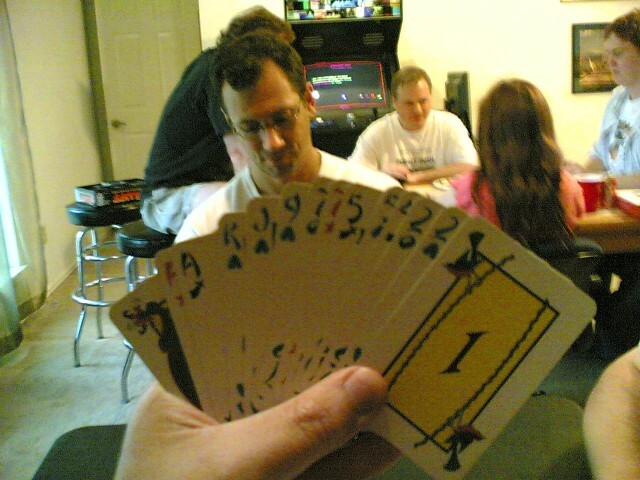 This entry was posted in Gaming on July 27, 2006 by Mark. Mike Chapel made this motivational poster… Amusing. This entry was posted in Gaming on July 25, 2006 by Mark. 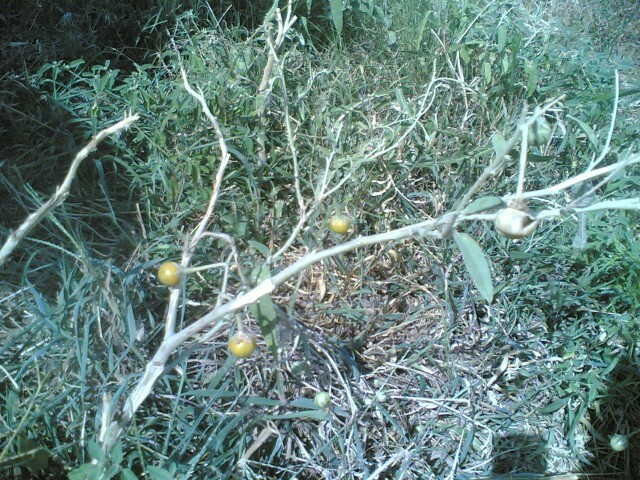 This entry was posted in Web links on July 23, 2006 by Links. Tonight, I cooked a 1″ thick cut of beef tenderloin. I was inspired by the Good Eats show Tender Is The Loin I. In it, Alton buys a P.S.M.O. (“Peeled”, as in of extra fat, and “Side Meat On”) of vacuum packed, wet aged, beef tenderloin. I checked and Costco has them for around $85. I haven’t bought one yet. After all, that is a lot of meat. So, I just bought one steak at H.E.B.. And then cooked it acording to his recipie. What was surprising was just how big of a fire ball the 1/6 cup of Hennessy V.S. Cognac produced. I turned off the flame. Poured the alcohol in. And lit it with a stick lighter. And looked up in awe at the huge ball of fire. It seemed to be going up the cupboards and reaching the ceiling. Of course, the fire alarm that went off was not helping matters. When it finally settled down, I poured in 1/2 cup heavy cream and started to look around. Fortunately, there didn’t seem to be any damage. And I do have a new fire extinguisher. This entry was posted in Cooking on July 23, 2006 by Mark. This group is starting to grow too large! Three strangers joined the mailing list and they played today. Also, Doug played again after a 6 month haitus. And we started really late. John showed up late from construction delays around Ikea. Curt showed up even later. And Steph and Nick showed up much later. We finished an hour later than usual. Sigh. 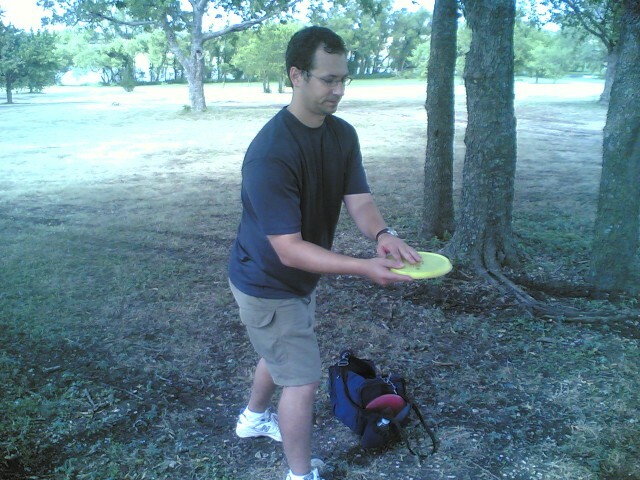 This entry was posted in Disc Golf on July 22, 2006 by Mark. 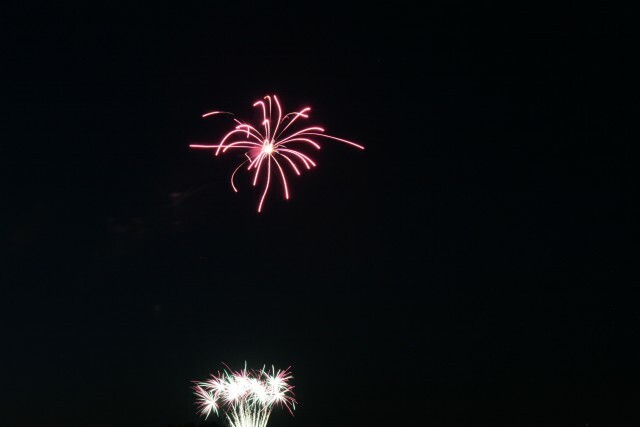 On the 4th, I was in no mood to take pictures of fireworks. It was also raining. So I was happy to learn that the fireworks were going on today. I didn’t read about it in the paper or see it on the television. 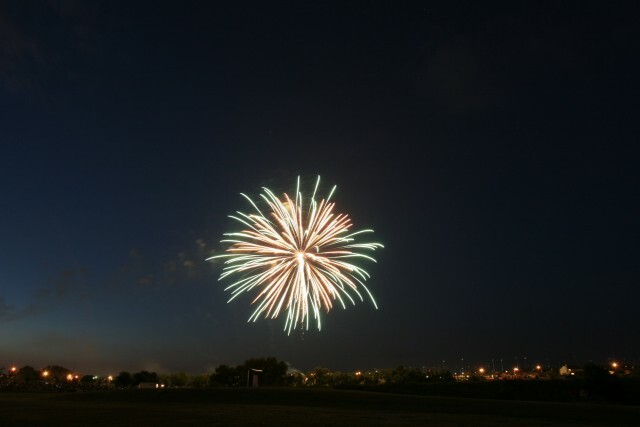 But, in a lucky coincidence, I saw them setting up for fireworks when I played disc golf. So after Pilates, I ran back home and grabbed my camer gear. I stopped by Taco Bell for some quick food and headed to the park. People were already streaming in. I forgot my lawn chair, but was able to use a cloth tarp that I carry in my truck. I walked over to the hill that is part of hole 14 and set up. And the fireworks started right away. Perfect timing! Although I had to rush around to finish setting up. During the show, I played around with the aperature setting. I was using a tripod and a remote shutter control. I guessed at the timing. The LCD screen would inform me of what the shot looked like. It is surprising just how much light a 2.8 apterature will let in. For the same time as a f/22 stop picture that looks like pitch black background, the f/2.8 will look like early dawn. After the show, I decided to hang out and watch Curious George from across the street. At that distance, the movie screen was the size of my 17″ TV set. And the sound was a decent volume. It took an hour before the traffic jam had cleared. Which is when I headed home. This entry was posted in Interesting on July 21, 2006 by Mark. Today, I went to play disc golf at Old Settler’s park and was in for a surprise. 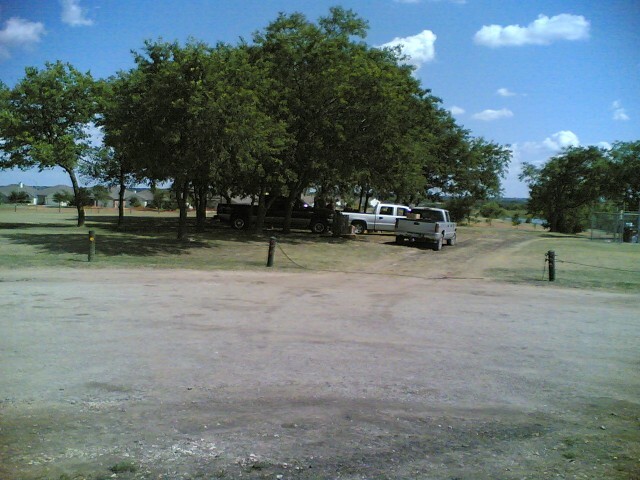 There were trucks parked in the shade where hole 18 is! 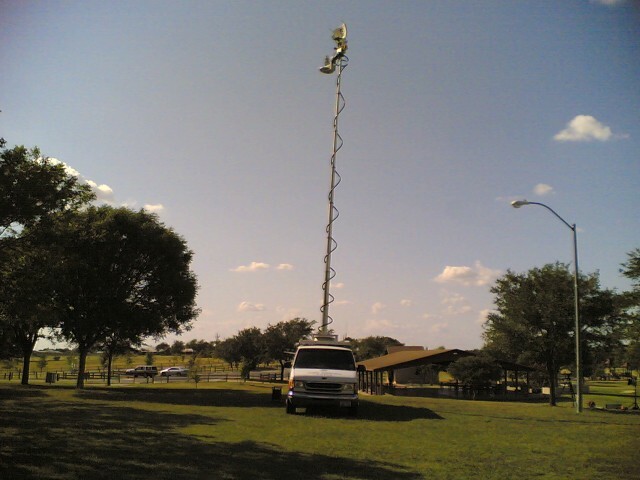 When I went over to investigate, I was told that they were getting ready for fireworks tonight. And they told me that my truck would be towed if left there (I would be leaving after 90 minutes and well before 9pm) and we couldn’t play disc golf on this side. They had also fenced off the area on this side of the lake. This meant that holes 1,2 and 3 were out of action. We started off at hole 4. Hole 5 was missing again (it seems that they use that field for parking for the fireworks). On hole 9, I got my disc stuck high in the tree. John and I spent a while throwing rocks and bottles at it in an attempt to knock it down. It was stuck pretty well. But it finally dropped! I was determined not to loose another disc so quickly! We aborted after finishing hole 13. It was really hot out and I wanted to stop by the Mexican ice cream store for some cold fruit water before Pilates. 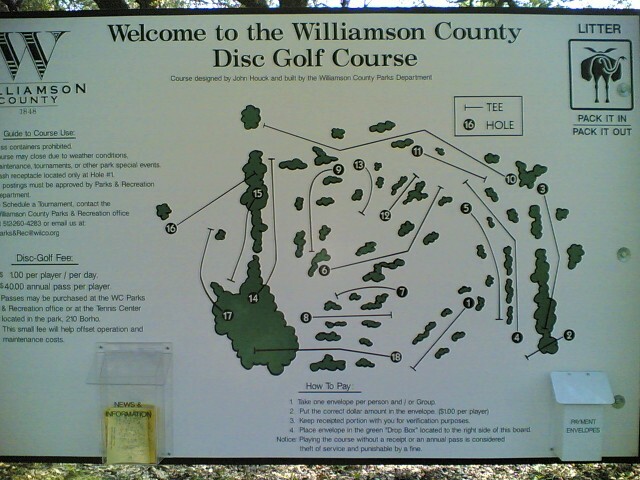 This entry was posted in Disc Golf on July 21, 2006 by Mark.